The amount of clients who are booking me for two sessions over consecutive days is becoming quite a regular occurrence – and it is something that is extremely useful (from a learning perspective) on so many levels. 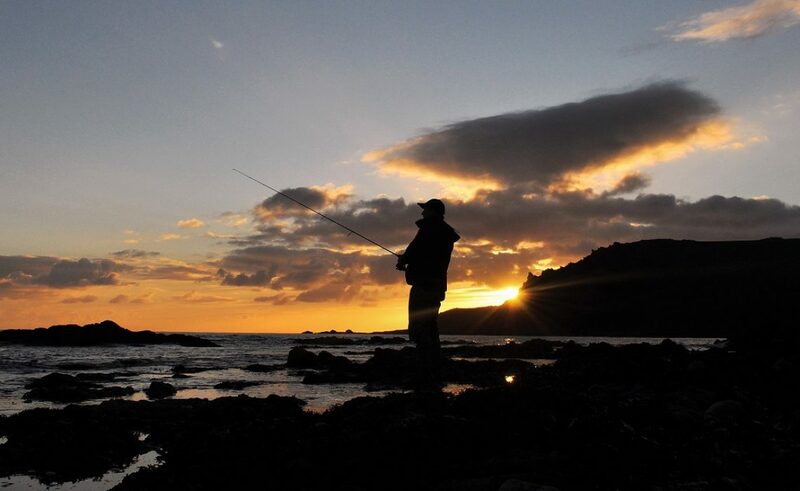 For example, we can fish two entirely different stretches of coastline (often with contrasting features), with all lure types (paddletails, surface, diving and weedless soft plastics) and often in differing weather, sea and tidal conditions. So you know someone is enthusiastic about their fishing when they contact you to say they would like you to guide them for three days! But why two parts to a blog post? Well, to be honest, there were so many positive incidents, in addition to the videos and photographs I managed to capture during these sessions that it just didn’t seem right to cram it all into one post. In the initial booking enquiry, Kev had expressed a desire to learn as much as possible about how to catch a bass from the shore, on a lure – something he had never achieved. Moreover, he’d only ever caught one bass from a boat in three attempts. He continued to describe how he’d caught sharks from the beach in Namibia and South Africa, in addition to how much he enjoyed catching trout on the fly – I had a lot to live up to here!! I knew this guy was ‘seriously’ serious when he asked me for a list of gear to purchase, so to ensure he was fully kitted out for his ‘Bass Fishing Holiday’ as he put it. And I’m not just talking about a few lures here – I’m talking about everything: rod, reel, hard lures, soft lures, braid, clips, leader, waders, boots, the lot, therefore, I duly sent him a list. Kev had already tasted success by the time this photograph was taken, and it was only to get better and better! We met at a local camp site close to where I live, and I knew instantly that we were going to have a blast. A real character, Kev has a real zest for life and is passionate about his own business and, of course, his fishing. This is when I saw the gear he had bought – blimey Kev, you really have pushed the boat out I thought! A HTO Shore Game 882LML rod and a Daiwa EM MS2500H reel were the first items I spotted, followed by two boxes of brand new lures ranging from Fiiish Black Minnows, the Xorus Patchinko in various sizes and at least three Tacklehouse Feedshallow lures – he really had used the list I’d emailed to him! I’d planned for him to fish 2 hours in daylight, followed by 2 hours in darkness for this particular session, and within 20 minutes of parking up, we’d put the world to rights and Kev was ready to make his first cast during what was a breathtaking evening – it was just so wonderful to be out on this majestic coastline. First cast – First bass! Now, I’ve had quite a few clients ‘get hit’ by a bass on the first cast, which is why I always, always tell people how important it is to make it count. After describing to Kev the lay out of the seabed (showing him a picture of it at low tide) and pointing out the direction the current/tide was running, onto his lure clip went a relatively diminutive surface lure – a Bear King Slim Skimmer. Leading up to these sessions there had been a lot of bait fish /mackerel activity therefore, as per previous posts, it seemed logical to expect the bass to be ‘switched on’ to items scattering, spluttering and thrashing on the surface. The 13g lure sailed out into the main flow of current, rod held up at 45 degrees Kev started to twitch the lure back in a ‘walk the dog’ fashion. An immediate swirl and a splash, and a bass is firmly connected between itself and a very happy plus surprised angler! It wasn’t a huge fish, but at around 2lb it was nice to christen Kev’s new lure set up. Sometimes, when you catch a fish first cast, it’s the only one you see for the remainder of the session! But I needn’t have worried this evening, as within ten minutes another swirl and a splash, this time just beyond a submerged rock that is seemingly a magnet for bass at times and Kev was in again – this time to the tune of a 3 pounder! 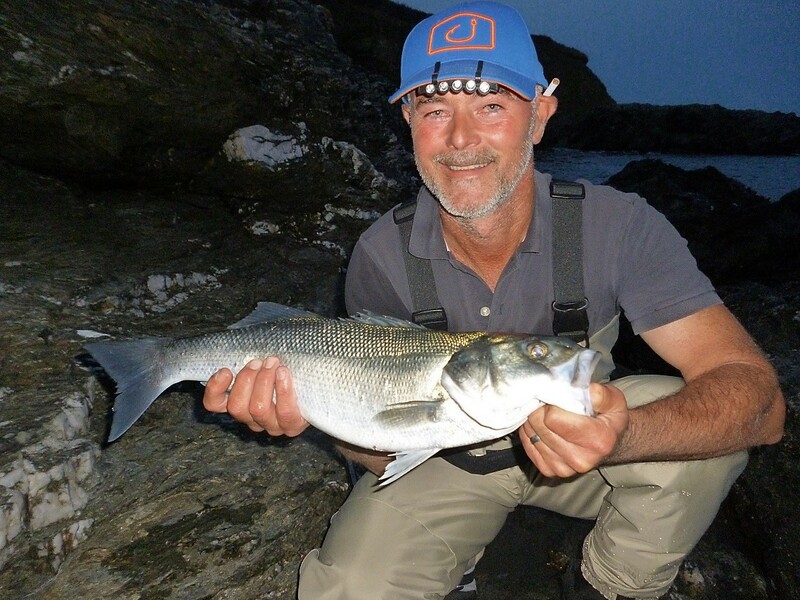 A warm, settled evening with a flat calm sea – Kev’s first ever shore caught bass grabbed the surface lure literally within a few seconds of fishing! A very ‘easy to work’ surface lure – the Bear King Slim Skimmer is a cheaper (but just as effective in my opinion) alternative to the popular IMA Salt Skimmer. Ultimately, it was responsible for two bass of 2lb and 3lb respectively within a short space of time. There were clearly a lot of fish around given the amount of swirls and near misses that the surface lure was having to endure. And at one stage it was almost a mackerel a cast therefore, a change was clearly required. During one retrieve, a very nice bass had followed Kev’s lure almost to his feet – so they were definitely mixed in with the mackerel and garfish. The decision really, was what lure to use in order to place another one in the net for my client… Following a considered look through my collection, I settled on the very reliable Ryobi Trapper Minnow 125F – that had been successful here. With the mackerel seemingly preoccupied with bait fish on the surface, my thought process was that a diving minnow type lure might tempt the predators underneath – the bass. This was when I caught sight of what was clearly a very nice bass, 3ft below me, in the astonishingly clear water. With net at the ready, Kev had by now, turned the fish and expertly controlled its next attempt at throwing the hooks when it swam upwards and towards us. When it eventually surfaced right in front of me, I slid the net under it as quickly as possible – Whooohooo! What a beauty! A 57cm bass – By now Kev was in bass heaven! It is testament to his ability and previous fishing experience that he managed to land it. Very well done Sir! By the time we’d unhooked and safely returned his prize it was pretty much dark therefore, I decided we should move to the next mark in order to commence the final part of the session. It was as we were walking along the coastal path that Kev realised he’d snagged one of the trebles on his ruck-sack. ‘Stay still’ I said, and I’ll unhook it… And with that he stumbled slightly and one of the hooks (barb and all) went straight into my finger – Ouch! It took 10 minutes of grimacing, but I managed to adjust the angle, wiggle it gently to try to reverse the hook via the same way it went in, and eventually it just popped out – thank goodness for that! Onto the next mark, the tide was just beginning to ebb as Kev flicked a white 6″ senko some 30m out over a reef covered by 4ft of calm, warm (17 degrees) water. As previously mentioned, I do tend to start with a subtle lure at night and by day if it’s calm and clear. Within a few casts Kev announced that he’d received a ‘hit’ or rather a very sharp tap on the rod tip (lure) that didn’t amount to anything – a small one perhaps? With no Moon or ambient light to speak of, things went rather quiet for 30 minutes – too quiet for my liking… Therefore, I decided to change Kev’s lure over to a Maria Squash F95. If you’re a regular reader of my blog then you’ll know that my clients and I have achieved some regular success at night with this little beauty so out she went into the darkness. With the tide now ebbing strongly (a very good time here) I’d literally turned my back for 30 seconds in order to have a quick drink when I heard Kev shouting! Although he was only 15m away from me, it was that dark I couldn’t make him out initially however, with the red filter quickly switched on, I rushed across the shingle to a glorious sight – Kev’s HTO lure rod bent double and the Daiwa reel screaming! The bass had smashed into the lure around a quarter of the way into the retrieve, so a good 25m out. Once again, the fish swam towards the beach before thrashing on the surface only 15m out – within the beam of my head-torch. It looked very decent and unexpectedly behaved itself for the final 10m and within seconds, it seemed, I was able to grab the line gently, in order to guide it onto the shingle. 2, 3, 4 and a 5 pounder in one evening! We measured the bass at 60cm and although it was rather slender, I estimated it to be around 5lb or just over. Maybe it’s time I purchased a sling and a decent set of scales perhaps? Either way, it had crowned a special evening for my client who was on cloud nine all the way back to the car. To catch bass of 2lb, 3lb, 4lb and 5lb in one session on three different lures does not happen very often. I was so happy it had all gone so well, as Kev had obviously invested a lot of his time, and of course money into his ‘holiday’. What would the next couple of sessions bring? Find out next time! Kev’s 60cm bass taken on the extremely consistent Maria Squash F95 – I am so glad I’ve got this lure in my box as it appears to do the business on those very dark nights, with zero ambient light. Brilliant blog Marc. Thank you for a wonderful experience. I will be back for some more. I can honestly say to anyone reading this article and never shore fished for bass that it’s a brilliant past time. I am hooked and Marc has so much knowledge to share. Book him, you won’t be disapointed.